Chandigarh 16th May:- Honda Cars India Ltd. (HCIL), leading manufacturer of premium cars, today launched its much awaited All-New 2nd Generation Honda Amaze in the Indian market.Built on an all new platform, the 2nd generation Amaze incorporates Honda’s spirit of innovation in research and development aiming to delight the customers.The car offers One Class Above premium experience with its all new bold design, sophisticated & spacious interior, more efficient powertrain, outstanding driving dynamics, advanced features and safety technologies. Speaking on the occasion, Gaku Nakanishi, President & CEO, Honda Cars India said that the All New Amaze has been developed keeping the needs and aspirations of Indian customers in mind. It is a big promise from Honda and we are confident that the All New Amaze will become one of the strongest pillars of HCIL business. This model will create new excitement in the segment and will provide us opportunity to expand our business across markets. He added further that in line with our commitment to offer latest technologies to the Indian consumers, Amaze comes with advanced Diesel CVT which is Honda’s first such technology in the world and also an industry first in the Indian market. The All-New 2nd Generation Honda Amaze has been developed at Honda R&D Asia Pacific Co. Ltd.following extensive market surveys with an aim to exceed the needs and aspirations of Indian customers. 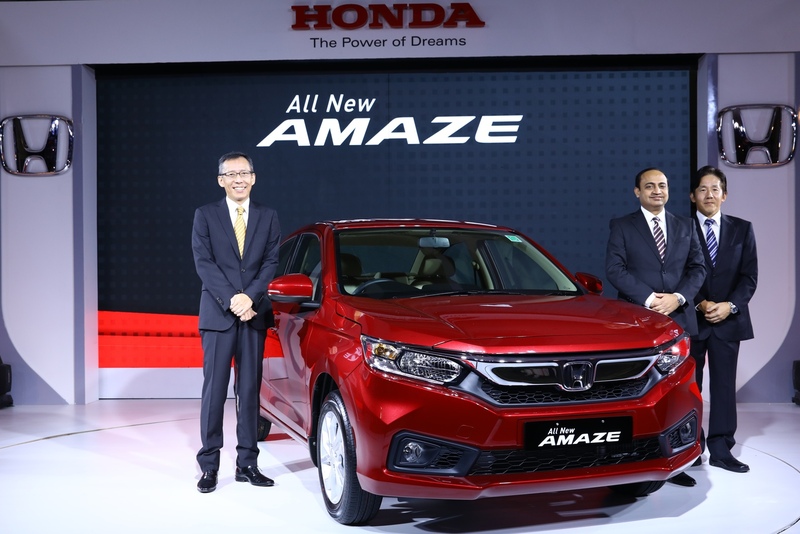 India, a key market for Honda globally, is the first country to launch the All-New Amaze.